So your website has been translated into English, surely now you can reach consumers worldwide? Big Mistake: almost 75% of people using the Internet don’t speak English. Spanish, German, Mandarin, Portuguese, Italian, Dutch… on the Internet language is the only barrier that still exists. Translating your website into several languages is therefore essential and it isn’t to be taken lightly. Today’s e-commerce figures show an enormous opportunity for retailers who are willing and ready to take on new markets. 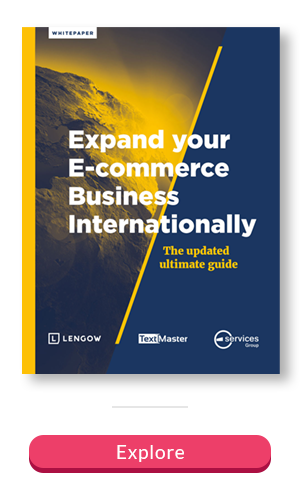 But to develop your sales and increase your visibility abroad, you have to face a major challenge: scaling and managing your product information. Product information management (PIM) is a central repository for managing product information across websites, e-commerce platforms, print catalogs, points of sale, mobile applications, and more. Decided to localise your website rather than just have it translated? Then you’ve already taken the first step towards a great international business development strategy. Next, it’s all about organisation: tackle the project stages in the right order, tick off the items on the key elements checklist one by one…and avoid the most common pitfalls: those mistakes which will have your target running for the hills rather than having anything more to do with you. Successful localisation guarantees expansion! How can you ensure your translations are always high quality?